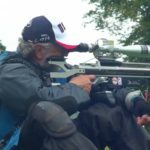 WFTF shooters, there are 2 spots available for this year's World Field Target Championships in England, August 7-11. 2 US shooters who signed up are now unable to attend. We have 27 shooters registered, 16 PCP and 11 Springers. FYI we only are allowed 8 PCP and 6 Springers to count for Team Score, but everyone shoots for High Individual, as well as qualified shooters competing for High Junior, High Lady, and High Veteran (55 and over). There will be 450 shooters from 38 countries participating. How is team USA selected for the worlds? RE: 2021 World Field Target Championships -- AAFTA needs your help! 2021 World Field Target Championships -- AAFTA needs your help!